Don't let their diminutive size fool you: these are serious monitors that punch way above their weight. Musikelectronic Geithain are German manufacturers of very high-quality studio monitor, hi-fi and sound reinforcement loudspeakers, and while the name is still relatively unknown in the UK, the brand is popular with European studios and broadcasters. Many of the company's products are both innovative and unusual, and the various models compete strongly against their equivalents from the likes of ATC, Harbeth, PMC, Neumann/K+H, and so on. The subject of this review, the RL906, is the most compact two-way active monitor in Geithain's 'RL' studio monitoring series, and it is intended for nearfield monitoring in small control rooms, video-editing suites, outside broadcast (OB) vans, and similar kinds of application. It is also ideal for use in compact 5.1 surround systems, when it is paired with a compatible subwoofer. One of Geithain's range-wide design features is the use of a coaxial driver arrangement. However, unlike many designs that embody the tweeter physically within the bass/midrange unit, Geithain prefer to keep the units separate, but mount them as close together as possible, with the tweeter suspended in front of the bass/mid-range driver. As is the case with most high-end monitor manufacturers, all models in the RL range share a common 'family sound', with the larger models simply offering more volume and bass extension relative to the smaller models. This means that speakers can be mixed and matched in a system (with small models handling the rear channels in a surround setup, for example), and it also ensures that something recorded using small monitors sounds the same when auditioned on large monitors (or vice versa). This is a standard requirement of broadcasters, and Geithain take it very seriously. 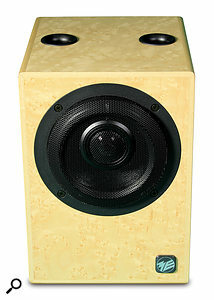 The front baffle is dominated by Geithain's preferred dual-concentric driver arrangement, with the reflex ports exiting, unusually, at the top of the cabinet. The RL906 is actually a redesign of an earlier speaker, with the most significant change being a repositioning of the tweeter so that it now sits over the top half of the bass/mid-range driver, instead of directly in front of it, as was the case in the original design. The reflex-ported cabinet measures 255 x 180 x 200 mm (HxWxD) and weighs 5.5kg. 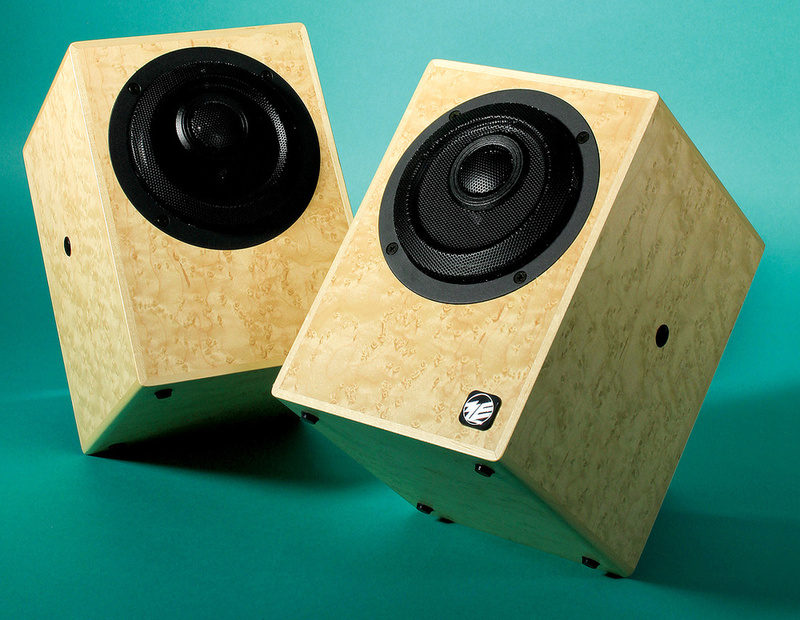 The standard model has a black ash finish, but the review sample came in a delicious 'birds-eye maple' veneer, which costs roughly £100 extra. The coaxial drivers, protected behind a contoured wire-mesh grille, dominate the top half of the compact front baffle. Instead of the cabinet ports opening below the drive units, as would be the case for most speakers, they are placed, very unusually, on the top panel instead. (Please don't be tempted to use them as a flower vase — although they are handy for carrying the unit, bowling-ball style!) This arrangement avoids the placement issues associated with rearward ports, as well as the audible 'chuffing' issues of forward-facing ports. It does make the speaker prone to dust and objects falling inside, I suppose, but I doubt that's going to be an issue in most installations. A green LED shines brightly from just below the tweeter to indicate when the unit is powered, changing to red if the amplifier clips and the protection circuitry activates. The rear panel carries the amplifier chassis, and is dominated by a heatsink arranged, again unusually, with the fins horizontally. 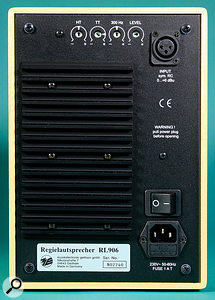 Across the top of the panel, to the left of the input XLR socket, four recessed trimmers are provided for adjusting the equalisation and input sensitivity. These are labelled, somewhat mysteriously, as HT, TT, 300Hz and Level. OK, so Level we can all figure out, and it adjusts the input sensitivity, with a nominal input level of +6dBu. No prizes awarded there! Turning to the HT adjuster, this boosts or cuts the treble response with a shelf equaliser starting above 2.5kHz, and is intended to compensate for personal preferences and the amount of HF absorption in the listening environment. The TT control sets the amount of attenuation provided by a high-pass filter, turning over at 200Hz, and compensates for placement close to room boundaries. Finally, the 300Hz control adjusts the boost or cut of a two-octave-wide bell equaliser centred on 300Hz, with a gain range of +2 to -4 dB. This is intended to compensate for the typical boost in that region that occurs when the speakers are mounted on the meter bridge of a large console, or on table stands above a desktop. Down at the bottom of the panel is the usual IEC mains inlet (fixed voltage with integral fuse holder) and a very chunky mains on-off rocker switch. On each side of the cabinet is a plastic blanking plug, which can be removed to allow fitting of an optional bespoke mounting bracket/H-stand. An alternative pillar-style stand is also available. German monitor speaker manufacturers are very good at providing comprehensive technical specifications and measurements (I wish UK and USA manufacturers were as open and diligent), and ME Geithain are no exception. The bass/mid-range driver is a magnetically compensated 4Ω unit with a 130mm (five-inch) cone, while the 8Ω tweeter is a 25mm-dome device. Each driver is powered by its own Class-AB MOSFET amplifier, with an active crossover at 3kHz and full electronic overload protection. The bass amp delivers 80W, while the tweeter amp manages 40W, and at full chat the speaker can manage 104dB SPL at one metre. The inherent self-noise is less than 7dBA (measured at one metre), while the THD figure is better than -40dB (0.01 percent) when producing 83dBA at one metre, which is a commendable figure. The published distortion plot shows a peak in the third-harmonic distortion at around 600Hz to 900Hz, and below 150Hz, but the plot is otherwise pretty flat and well controlled. Second-harmonic distortion lies comfortably below the third harmonic at all frequencies, except below 150Hz, and doesn't suffer that lower-mid peak at all. The frequency response is extremely well controlled, easily maintaining ±3dB between 50Hz and 20kHz, and moving 30 degrees off-axis results in a smooth HF roll-off from about 300Hz, reaching -6dB by 10kHz. The manual provides comprehensive guidance on positioning, recommending that the speakers be spaced apart by at least one metre and no more than 2.6 metres, and placed at least 0.5m from rear and side walls. However, there does seem to be some confusion, in that the manual says the speakers were designed to allow them to be used facing directly forward, if required (which is often necessary in TV production rooms and OB vans), but all the placement diagrams suggest that they should be toed-in to face the listening position. I found that the default EQ settings favoured orientation facing directly forwards, rather than towards the listening position. 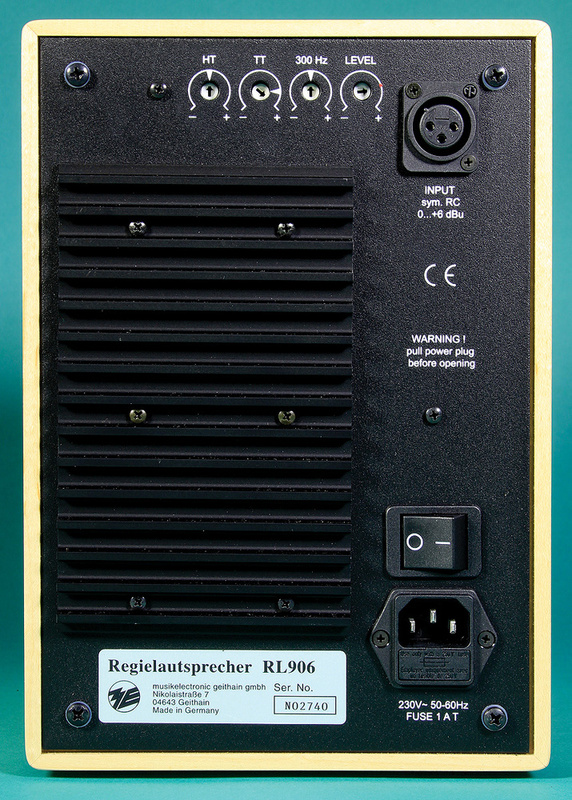 The RL906's rear panel houses the audio and power inputs, as well as EQ and level trim controls. I've auditioned several Geithain monitors to date, including the amazing flagship 901K with its ingenious cardioid bass response. I've been very impressed with the honest neutrality and consistent tonality of the company's monitor designs, and the little RL906 doesn't disappoint. Despite its diminutive size, this is a gutsy little speaker that places quality above volume, but it doesn't shy away from volume much, either: 104dB SPL at one metre is a lot! The RL906 is very nicely and skilfully balanced across the spectrum, without the forward upper-mid that so many so-called monitors use to make them seem more revealing than they really are. However, as I mentioned above, I found that, with the EQ controls at their default positions, the best spectral balance was achieved with the speakers facing directly forward, rather than aimed towards the listening position. Setting them up with the more normal 30-degree toe-in produced an overly bright sound that had me quickly reaching to turn down the TT trimmers! Having said that, with appropriate positioning, angling and/or TT tweaking, the high end is very open and well extended, with plenty of detail and resolution while retaining a sense of naturalness and honesty. The bass end is inherently limited by the small cabinet volume, but is fairly extended, yet well damped, and port resonances seem to be extremely well controlled, with minimal 'overhang'. The bass only starts to tail off below about 85Hz, so most of the energy of a kick drum and bass guitar is represented pretty well, and mixes seemed to translate nicely to my reference PMC IB1 speakers. The critical mid-range is very clean and detailed, allowing small mix-balance and EQ adjustments to be auditioned clearly, and recording faults to be identified quickly. Over-compression artifacts in some commercial mixes stood out very clearly, which is a good indicator of accurate dynamic portrayal, and lossy codec artifacts were also revealed very easily. Using my favourite and ultra-revealing recorded voice tests, the little RL906s proved extremely accurate and neutral, without any significant coloration through the vocal range — something that depressingly few 'monitor' speakers achieve below the £1000 price level. The use of a small cabinet baffle in combination with the neat coaxial driver arrangement delivers impressively pin-sharp and very stable stereo images, with an excellent sense of width and depth perspectives, and clear reverb decays. Moreover, the tonal quality remains extremely consistent even if listening height and horizontal position change, making these monitors ideal if you find yourself constantly standing up to reach controls on a console, and then sitting down again! It is a constant source of frustration that true monitor speakers remain as expensive as they are, but the Geithain RL906 can be counted among the list of true monitor speakers, despite its compact dimensions. I would recommend auditioning these little speakers if you are in the market for true reference-grade monitors. They punch well above their weight and size, and the cost is entirely justifiable in comparison to other similarly priced speakers. The RL906 is priced to compete directly with serious active, two-way, nearfield monitors like the Adam S2X, Dynaudio's BM15A, Event's Opal, Focal's Twin 6BE, Genelec's 8050A, PMC's DB1SA MkII (although, strictly speaking, this is a passive powered monitor, rather than genuinely active), PSI Audio's A17M, Unity Audio's The Rock, and Quested's S8R. This is impressive company to keep, but makes the purchasing decision rather difficult, as these are all very capable monitors. If size is important and you're looking for easily portable monitors, however, then only the PMC DB1SA MkII comes close. For those who prefer to maintain a digital signal for as long as possible, the RL906D version (£3259.20 per pair) is identical in every respect to the standard RL906, with the addition of a digital AES3 input (but retaining the standard analogue input, too). An extra switch selects whether the speaker reproduces the left or right AES3 channels, or a mono sum of both. This version also features a useful 16-step digital audio delay to allow the acoustic output to be time-aligned with the images from a video display, such as a plasma or LCD screen, to maintain accurate 'lip-sync'. Four dedicated H-frame floor stands are available (with various heights between 1.1 and 1.6m), attaching to the sides of the monitors. There is also a simple 1.06m pedestal stand for domestic applications, which the speaker sits upon, and U-bracket attachments to enable the speaker to be mounted from the ceiling or a wall, or supported from a table stand for desktop applications. Since the very compact dimensions of the RL906 make it ideal for location recording, Geithain's UK distributors, Sound Link, have commissioned custom-built hard and soft cases. The flightcase (model SLK906, priced at £597.60) is constructed from 7mm Astroboard with metal corners and features recessed handles on both ends and the lid. The interior is lined with a dense foam shaped specifically to cushion the speakers appropriately. The SLB906 padded soft carry-bag (£153.60) is constructed from a tough, puncture-resistant Cordura-style fabric, with dense foam linings and internal base and lid panels made of Astroboard. The lid also features a pocket for mains and audio cables, and double-stitched fabric straps with rubber handles envelop the entire bag for secure carrying. Both the flightcase and padded bag accommodate a pair of speakers. Sound Link also offer a padded bag for carrying the RL906 table stands, called the SLB TS (£141.60). Coaxial drivers for very precise, stable and expansive stereo imaging. Powerful amplification: high maximum SPL and linear dynamics. Extended bass response and well-damped ports. Very clean, neutral and accurate tonality. Genuine monitor quality remains frustratingly expensive. I had to give them back! 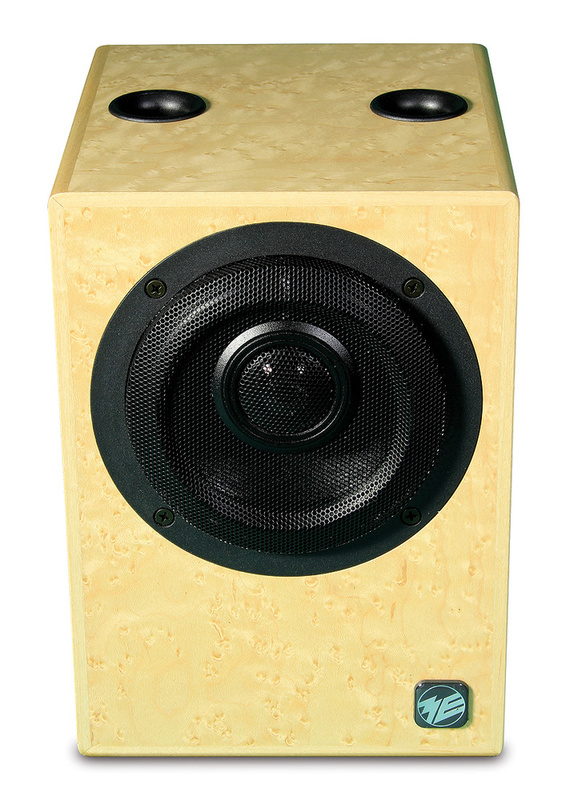 The Geithain RL906 is a very compact, active, two-way studio speaker genuinely worthy of the title 'monitor'. £2372 in black; £2599.20 in wood veneer. Prices per pair, including VAT. Sound Link +44 (0)1869 600817. £2372 in black; £2599.20 in wood veneer. Prices are per pair.